Currah Micro Speech is a speech and audio output add on for the Spectrum. Info available on Wikipedia and World Of Spectrum. This is great if running of spectrum with RF output (Standard connection to TV through aerial), however does not work if your Spectrum has composite modification. I modified my Currah Micro Speech unit to work with a composite modified spectrum (and still work with normal RF spectrum) by doing the following (this works for my setup but if in any doubt please don’t do this to yours – I take no liability at all). 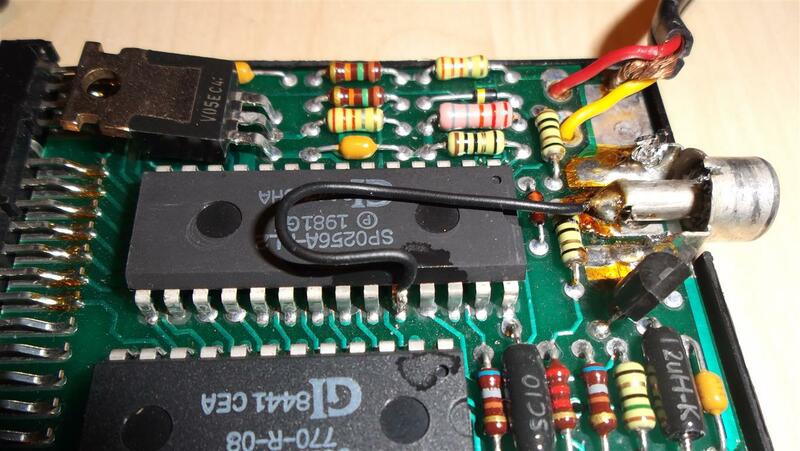 so unmodified the RCA connector goes to RF output on the Spectrum and the 3.5 mono jack goes into the Spectrums ear socket. The sound and speech get mixed and combined with the TV signal. Step 1 : Remove the case. The case is clicked together top and bottom – I unpried with a flat blade screwdriver initially then finger nails. Inside, there are 3 chips, the one that we are interested in is SPO256A-AL2 which is the speech chip. Pin 24 (5th down from top right) is Digital Out and appears to be unused by the Currah Micro Speech PCB. As sound is output directly from this, I hooked into this and connected directly to the signal for the RCA connector. This leaves the rest of the circuit intact for possible use with an unmodified Spectrum if required. What it also means is no sound is taken from the spectrum. 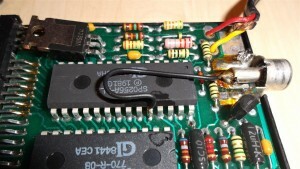 Once happy with the soldering / connections, no shorts etc connect to the spectrum – you do not need to connect the TV or Ear cables – just the unit to the Spectrums edge connector. 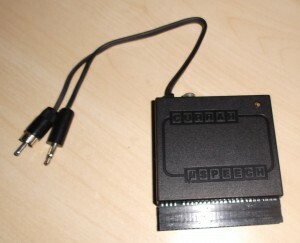 Connect the RCA socket of the currah to your speakers / audio input on scart etc. On mine I have Composite to HDMI converter and connect the Composite signal from the modified spectrum to cvbs, ear from the spectrum to left audio and output from the currah microspeech to right audio.